What is Louis L'Amour Lost Treasures? Currently included in the project are Louis L'Amour's Lost Treasures: Volume One (On Sale Now!) and Volume Two, which will be published in the fall of 2019. These books contain both finished and unfinished short stories, unfinished novels, literary and motion picture treatments, notes, and outlines. They are a wide selection of the many works Louis was never able to publish during his lifetime. On November 20, 2018 we will release No Traveler Returns, L'Amour's never-before-seen, COMPLETE first novel. 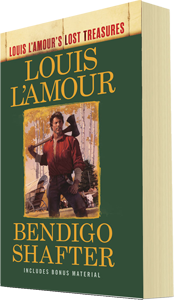 Originally begun in 1938, it was completed, utilizing careful research and close attention to Louis' pre war writing style, in 2015 by Beau L'Amour, the author's son. In the future, there may be a selection of even more unreleased or recently restored L'Amour titles. Additionally, many notes and alternate drafts to Louis's well-known and previously published novels and short stories will now be included as "Bonus Material " postscripts within the books that they relate to. For example, the Lost Treasures postscript to Last of the Breed will contain early notes on the story, the short story that was discovered to be a missing piece of the novel, the history of the novel's inspiration and creation, and information about unproduced motion picture and comic book versions. This Website also contains a good deal of exclusive material, such as even more pieces of unknown stories that were too short or too incomplete to include in the Lost Treasures books, plus personal photos, scans of original documents, and notes. All of the works that contain Lost Treasures project materials will display the Louis L'Amour's Lost Treasures banner and logo.